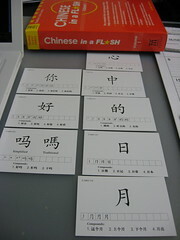 Just to convince my friend, Wai Ling, that I’m dedicated to learning chinese. Though I doubt I’ll learn it in a flash 🙂 It took me a long time to find “xin” (card 320). After enduring years of dim floor lamp lighting in my room*, I finally went ahead to get fluorescent lights. It took me 3 trips to the store to get all the stuff that I needed! 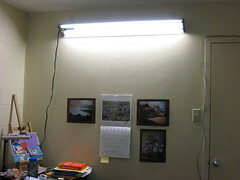 Bought the reflector light fixture-thing and 2 fluorescent tubes. Came home and found out that it didn’t come with the screw hooks. Postponed fixing it up till next day. Bought the screw-on hooks and a plier. Came home, measured the length of the cord and realized it was rather short but decided to fix it up anyway. But the light ended up being too low, just slightly above my head…that won’t do. * Unlike Malaysia, most houses in the US do not come with permanent fluorescent lights. So, most students end up going to walmart to get one of those cheap floor lamps that uses incandescent light bulbs, or the more environment conscious would get CFL light bulbs. Either way, these floor lamps are usually not bright enough. It tasted quite good, sort of fresh tasting. 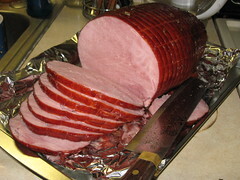 I finally baked the easter ham that I won in a raffle months ago. I used a pineapple juice and honey glaze on it. 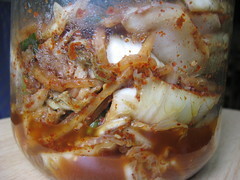 Many baked ham recipes use whole cloves (bunga cengkih) but whole cloves cost like $5 for a small bottle so I left it out. I gave away some of the ham, freezed a whole lot, and chopped up some for pineapple fried rice. 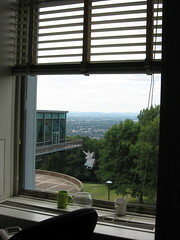 My advisor is on her sabbathical. 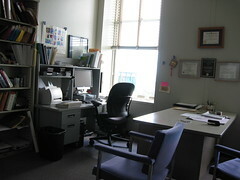 I got permission from her to go through her collection of journals in her office. She even lets me keep the duplicate copies of her journals. I call this nohohon (sunshine buddy) my “yes-man”…everything also nods head. I was looking for this all over KL. I saw some at Isetan KLCC but didn’t like those, then found some at Jaya Jusco MidValley and contemplated many minutes (and I mean MANY) before settling on this one. When I went back to Penang, I saw a whole bunch at MPH Gurney Plaza! Haiyah…didn’t even need to go down to KL and spend money on rapidKL just to get one. 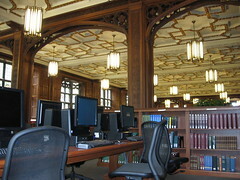 This is the newly renovated Linderman library – Lehigh’s humanities library. I was using the computer here but the table is a little too narrow so the monitor is like in your face. Too close, very uncomfortable, so had to move to a different computer somewhere else eventhough the chair was rather comfortable. It’s summer now so there’s hardly any students around, a very good time to “jom” a computer and a table to do some serious studying in a beautiful air-conditioned place. I should start spending many hours here from now on. I had the last pong pneah today. No more malaysian biscuits/cookies left. 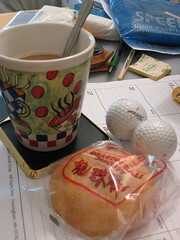 And that’s the two golf balls I picked up few days ago.